Jackson, CA - Friday, September 2, 2016 - Nestled in the rolling hills of Amador County is the beautiful and historic St. Sava Serbian Orthodox Church in the small, quiet town of Jackson, California. It was the site of this year’s Diocesan Days celebration of the Serbian Orthodox Diocese of Western America, which takes place each year on Labor Day weekend. 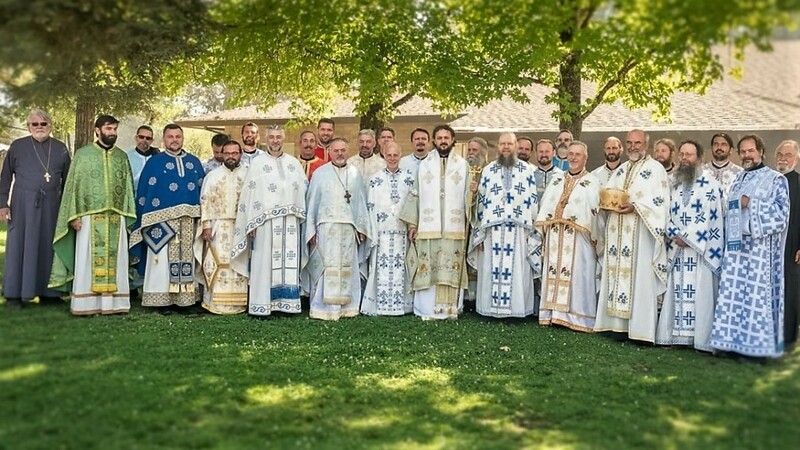 By noon clergy, coming from various parts of the vast diocese, slowly began to arrive at the beautiful St. Sava Camp where they were met and received a blessing from their ruling hierarch, His Grace Bishop Maxim of Western America. After lunch the clergy were ready for the first item on the day’s agenda - the Clergy Seminar. This year’s guest speaker was Bogdan Lubardic, Ph.D., Professor of Philosophy in the Faculty of Orthodox Theology at Belgrade University. Mr. Lubardic’s topic was entitled, Learning with St. Paul: How is the word of God (kerygma) to be offered to the world – Evangelization, Enculturation, Mission. Professor Lubardic spoke eloquently, taking as a central point in St. Paul’s preaching his interaction with the Athenians in Acts 17:22-31. While the speaker spoke at length of the philosophical thought of the people St. Paul was encountering and gave a more clearer picture to his listeners that they might grasp his evangelization tactics – this offering of the word of God – to the people who had an altar to “an unknown God”, her offered points for pondering. First, St. Paul addressed the basic need, the problem of sin, death and corruption. Secondly, he indicated that we now have a Savior, Jesus Christ who provides the gift, which is the Church, a workshop through a sacramental life. And, finally, the challenge: not only do we have Christ but we’re called to emulate Him ourselves. The Book of the Acts of the Apostles as a historical book is in the middle of the New Testament, meaning it is placed between the Gospels and Epistles, which reassures us that it is a historical event and Mr. Lubardic gave a deeper insight into the historical atmosphere at that particular time. However, he also noted, that the Book of Acts does not have a concluding chapter and, subsequently, we are all called to action. Just as St. Paul encountered and challenged the Gentile world we are reminded that wherever Chris is rejected is the gentile world. The seminar ended with a lively question and answer session. Other afternoon activities included a Diocesan Council meeting held immediately after the Clergy Seminar, while the Kolo Sestara held their meeting simultaneously in the classroom off the main hall. Both meetings ran straight to Vespers, which was served promptly at 6pm under the tent set up on the campgrounds. With the bishop’s blessing, Fr. Predrag Bojovic served Vespers while two seminarians from Prizren Seminary in Kosovo, guests at this year’s Diocesan Days celebration, beautifully sang the responses. Dinner was served in the main hall after Vespers. Following dinner V. Rev. Slobodan Jovic addressed the faithful, introducing the head table and honored guests and the newly appointed Episcopal Deputy Protopresbyter Stavrophor Nikola Ceko. Taking the microphone, Fr. Ceko, opened the floor to questions noting that this is the first Diocesan Days after the historical Holy and Great Council in Crete. This prompted questions from the floor related to the Council, which His Grace Bishop Maxim was pleased to answer. This year’s guest speaker, Professor Lubardic, also spoke during this question and answer session. The dinner concluded with two songs, sung soulfully by the guest Seminarians from Prizren Seminary. After the announcements for the following day’s events, which begin promptly at 9am with Matins and 10am Hierarchical Divine Liturgy, the first day of this year’s Diocesan Days came to an end. A reception for the clergy followed the liturgy after which the clergy and faithful gathered at the main hall for lunch. Towards the end of lunch the guest speaker, Dr. Bogdan Lubardic, delivered an address entitled: Learning with St. John: How are we to understand and overcome death – on the Mystery of the Raising of Lazurus. Professor Lubardic noted that the gospel is not a sentimental narrative but it is filled with meaning and should subsequently be read with the search for a deeper meaning of the text. This is precisely what he did in recounting the episode of the Raising of Lazarus found in St. John’s Gospel which is a lesson in overcoming death through the confession of faith, the repentant shedding of tears in order to be seated with Him. It was Lazarus who sat with Jesus in the gospel narrative and many of the Jews came not only to see Jesus but to see Lazarus whom Jesus had raised from the dead. This seemingly small detail in the narrative of the Raising of Lazarus played a major part in the professor’s talk as he pointed to this seating, this presence with Christ at the breaking of bread of the Holy Eucharist which is a foretaste of the Heavenly Kingdom. In the presence, and the participation of the Eucharist, we overcome death. Immediately after this talk the clergy and faithful made their made to the St Sava Church hall where the Annual Diocesan Assembly was held. Of course, the campgrounds were not left completely abandoned, as there were soccer games and youth activities that lasted all afternoon until the time allotted for Vespers. Protopresbyter Nikola Ceko served Vespers, assisted by Deacon Paul Germain and the beautifully voices of our visiting seminarians from Prizren Seminary. That evening, as everyone gathered in the main hall once more for dinner, Jasmina Boulanger, Vice President of the Diocesan Council, took to the microphone for a surprise announcement; a surprise for the bishop. She recalled how ten years ago the Western American Diocese received a wonderful gift at the enthronement of their then newly appointed Bishop of Western America, His Grace Maxim. The members of the Diocesan Council wanted to mark this occasion with a gift to the bishop as a token of not just their appreciation but a sign of the love the entire Serbian Orthodox Diocese of Western America has for their dear Bishop Maxim. Upon opening the gift everyone in the hall rose to their feet in applause and loudly and joyously sang “Mnogaja Ljeta”. Live music and dancing followed and lasted until late in the evening. The final day of the 20th Annual Diocesan Days celebration came on the Lord's Day, the 11th Sunday after Pentecost, the feast day of the Holy Martyr St. Agathonicus. The clergy were vested early during Matins Sunday morning in preparation to welcome and piously receive the relics of St. Sebastian of San Francisco and Jackson who, during the course of Matins, was escorted into the makeshift church by His Grace Bishop Maxim and all the clergy of the Western American Diocese. With the bishop's blessing Protopresbyter-Stavrophor Nicholas Ceko beautifully delivered the homily after the gospel reading during liturgy, speaking on relationships – both the ones we have with one another and our relationship with God. Singing the responses during the liturgy were the students of Prizren Seminary as they had all weekend. After a continental breakfast the grand banquet was held in the main hall. The clergy and faithful were given one last time to listen to this year's guest speaker, Dr. Bogdan Lubardic, as he delivered his Keynote Address towards the end of the luncheon, entitled: Learning with St. Matthew: How are we to overcome and understand fear- on Christ the eternal source of Joy and Peace. His talk centered on the gospel event found in the 14th chapter of St. Matthews gospel. Namely, Jesus' walking on the water. The theme was the human conditioin of fear, which we collectively run away from but cannot escape. As he did in previous talks, Dr. Lubardic disected the reading from Scriptures in order to better understand its deeper meaning. This gospel episode which gives a deeper understanding of the human condition of fear reveals its twofold dimension: fear of the unknown and fear in not knowing Him who dispels all fear which, in fact, is a lack of faith due to sin. Dr. Lubardic tied his keynote address to Fr. Ceko's morning homily about relationships, stating that the only way man can overcome fear as an inherit human condition is through a living faith, that is, a living relationship with Christ our Lord who is the only one who dispel all our fears. Subsequently, it is interesting to note that when St. Peter, who began to slip upon walking on the waters, calls to Jesus "Lord, save me“, the waters become calm. Which is to say, that our confession of our faith results in peace in our lives. This slipping and drowning in the waves described in the gospel narrative, our guest speaker noted, will never occur and happen in our own spiritual lives as long as we keep our view focused on Christ. Dr. Debra Tasic, on behalf of the Diocesan Council, thanked this year's guest speaker for accepting the invitation to participate in this year's Diocesan Days celebration and for his wonderful talks throughout the weekend, but she also wished to thank and greet his 12 year old daughter, Marija, who joined him and left a deep impression on everyone that met her during the 3-day diocesan celebration. Maria was presented with a bouquet of flowers. The guest seminarians from Prizren Seminary were once more called upon to perform a number of Serbian folk songs which were received with much enthusiasm and thunderous applause. His Grace, Bishop Maxim, movingly bestowed his episcopal recognition, the Gramata, to Djakonica Danica Triva from Jackson, which was received with much applause and a much deserved standing ovation. Thus, the yearly diocesan weekend event, known as Diocesan Days, came to an end but also continued with music and sports activities and fellowship throughout the day just as it continues, from week to week, in our diocesan parishes and from one year to another as we move eschathologically towards our fellowship with the Lord and His glorious Saints in His Kindgdom which which has no end.